After a week of unprecedented Byzantine conspiracies, tactical games, and scandalous manipulation of public opinion, Papandreou finally stepped down from Prime Minister. Lukas Papademos, ex vice president of European Central Bank, was nominated as PM. Papademos new government is supported by PASOK (socialists), Nea Dimokratia (New Democracy-conservatives),LAOS (Popular Orthodox Alert-racist extreme right) and Dimokratiki Symmahia (Democratic Alliance-ultra neoliberal spit of Nea Dimnokratia). The two major left parties, KKE and SYRIZA, said that the formation of this government was a parliamentarian coup and they asked for snap elections right now. The Left didn’t participate in any negotiations and left leader didn’t even go to the institutional “Council of political leaders” called by the President of the Republic. Democratic Left (right wing split of SYRIZA) will also vote against Papademos. The new government has the task to vote and implement the October 26 bail out agreement with EU and IMF. After that, there will be snap elections, probably on February 19. 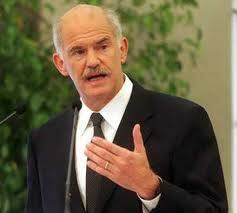 Papandreou ended his career in a tragedy and in a farce, at the same time. The tragedy took place in Cannes, during the G20 meeting. In this pretty French city, Merkel and Sarkozy dictated the question and the time of the Greek referendum. Papandreou had declared that he would have organized a referendum about the bail-out agreement on January. In Cannes, he accepted a referendum on Greece’s participation in Euro zone that would have taken place on December 4. After he accepted everything he was asked for, the Greek PM took the plane back home and left Sarkozy and Merkel to discuss and make decisions about the future of Greece. ATTAC France described the incident as “loss of democratic sovereignty”. In fact, it was more than that. 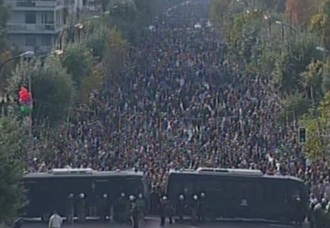 It was the humiliation in live broadcasting of 10.000.000 people, a shame for Greeks and Europeans as well. Our grandparents sacrificed their lives in the great antifascist war for the right of European peoples to determine themselves. Now this right is abolished by markets, banks, EU and the leading countries of Europe. After Cannes, it was obvious that Papandreou was finished. It was obvious to everybody, but not to him and his party clan. Despite the revolt of many PASOK MPs and some major Ministers, Papandreou finally achieved a compromise: he would get a confidence vote in Parliament and then he would resign (as it finally happened). So it was the first time in world political history that a government gets o confidence vote in order to immediately step down… With this unbelievable compromise Papandreou managed to stay in the game and to retain control of PASOK. He will probably lead his party in the elections. On the other hand, his rivals managed to kick him out of the PM office and open the road to his succession. Both of them avoided a split of the party that would have been inevitable in any other way. Generation to come will find extremely difficult to understand how such an incompetent person as Papandreou, made such a political career. After the confidence vote in government’s resignation, the negotiations started. We have to admit that the whole thing was more immoral than negotiations between Italian political parties during Andretti era. Until the eve of confidence vote, Antonis Samaras, leader of Nea Dimokratia, was an intransigent opponent of IMF-EU austerity plans. He used to say that such policies destroy any perspective of economic growth (something which is absolutely true). Nevertheless, he never clearly explained what his real political agenda was. In reality, Samaras wanted to get votes of the people who are angry with austerity plans, but without having the commitment that he will make something different when he comes to power. In the eve of the confidence vote, Samaras amazingly announced that after the disastrous Papandreou governance, October 26 bail out agreement became inevitable. He also announced that Nea Dimokratia will vote in favor of the agreement, although until that time it voted against the notorious “Memorandum” (the initial fundamental agreement between Greek Government with IMF and EUY) and all austerity laws which followed it. That was a real sock for that part of the Right wing working people who are totally against Memorandum and participated in the “squares” movement. It is believed that Samaras will pay a heavy political price for this sudden turn. Why did Samaras make this move? The main reason is that he was extremely pressed by EU and Greek capital. The Europeans said that they wouldn’t have given any more loans if Greece had gone to immediate snap elections. They added that the formation of a “government of national unity” is the necessary condition for Greece in order to take the money. EU also shaped the task of the new government: it should vote and implement the bail-out agreement, the 2012 budget and all the “necessary” austerity laws. Only after that “Greeks can go to elections”, as it was said by a German officer. After the European ultimatum there was a massive Media campaign in favor of the “national unity government”. SEV (the League of Greek Industries) and all the major bankers also pressed in that direction. Even the archbishop made a similar appeal. So Samaras , a real neoliberal demagogue, he couldn’t do otherwise if wanted to be part of the official political game. Why EU and banks don’t want the immediate snap elections? Because the elections will create instability for the regime and they will reinforce political parties which are against austerity plans. In the polls the two major neoliberal parties get together 35% and all the Left parties get more than 15%. If we add to this numbers the massive abstention, it becomes evident that it will be extremely difficult for any new government to insist on austerity policies. Finally Lucas Papademos was nominated as Prime Minister. Papanadreou and Samaras didn’t want Papademos because they were afraid that a Papademos government might threat the bipartite political system. Nevertheless, they could not resist to the pressure of EU, banks, Media and the ultra-neoliberal fractions of their parliamentarian groups. Papademos is a person that EU and the banks absolutely trust. He is a banker and he is not elected by anybody. As a result, it is believed that it would be more difficult to make political pressure on him. Papademos is the ex vice president of European Central Bank. As president of Greek Central Bank was the architect of the financial tricks that let Greece to enter the euro-zone. In Greece these tricks are called “creative accounting”, in Europe “Greek statistics”. So the architect of Greek statistics is the EU’s choice for the office of Greek PM. The new government is the most reactionary Greek government after the fall of the dictatorship in 1974. It is not elected by the people and it is mainly formed in order not to let the people express their will. 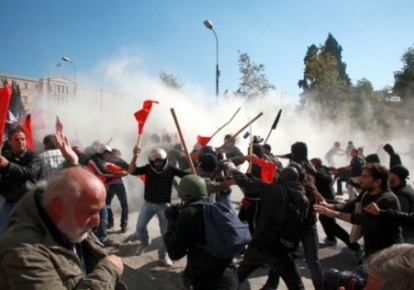 Nevertheless, we should not forget that Papandreou stepped down because of massive popular resistance. And it is popular resistance that will beat as well the new puppets government. 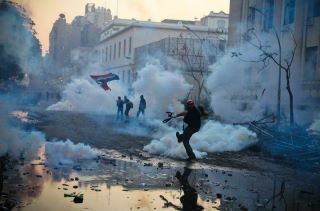 As you have probably read in mass media from all over the world, political situation in Greece is changing rapidly. Yesterday, Papandreou announced that there will be a referendum on the bailout package agreed with EU, IMF and IIF (International Institute of Finance, the international syndicate of banks). The Greek PM also asked for a confidence vote by the Parliament, which will be held on Friday evening. Of course everybody was amazed by this announcement. There is a very negative reaction by international markets and EU leaders. 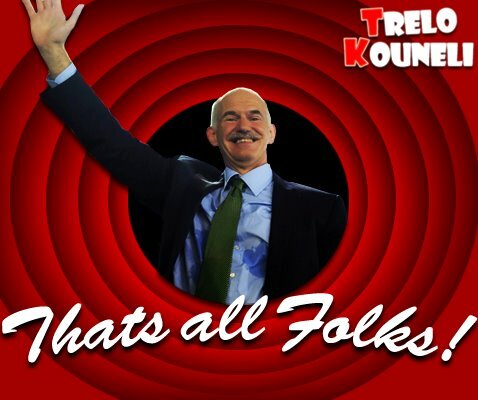 Furthermore, there is a revolt inside PASOK parliamentarian group and practically all the mainstream commercial media are accusing Papandreou of destroying the country and putting at risk its participation in the Euro-zone. At this moment, Papandreou is politically isolated. The most probable scenario is that he will not get a confidence vote on Friday and we will go for a snap election on early December. But why Papandreou took this obviously suicidal decision? First of all, massive angry protests during the National Day of October 28 (http://yalmpanis.wordpress.com/2011/10/28/massive-angry-protest-stops-military-parade/) made clear that the government hasn’t any social support. 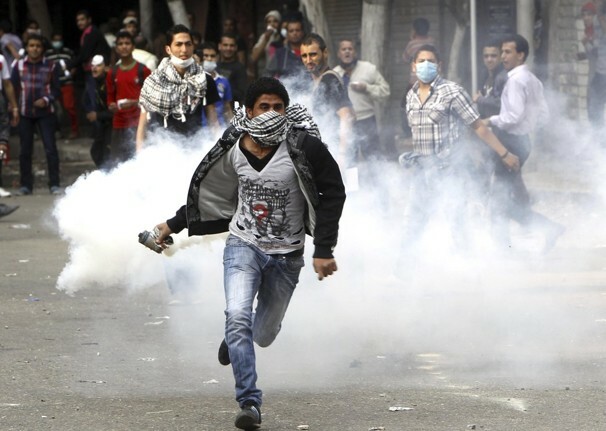 In addition to that, October 28 protests proved that the government is rapidly losing control of the country. A government cannot rule if its MPs cannot drink a coffee in public because they are afraid of been attacked by people passing by. Popular unrest led government to a dead end. In such cases, normal politicians resign and open the road for snap elections. But Papandreou is no normal politician. He is a PM whose father and grand-father were also PMs. Papandreou is one of these great Greek families who think of the country as their own personal asset. They have no doubt of their hereditary right in political power. As a result, resignation is out of the question. Besides that, Papandreou is a person of very low political abilities. 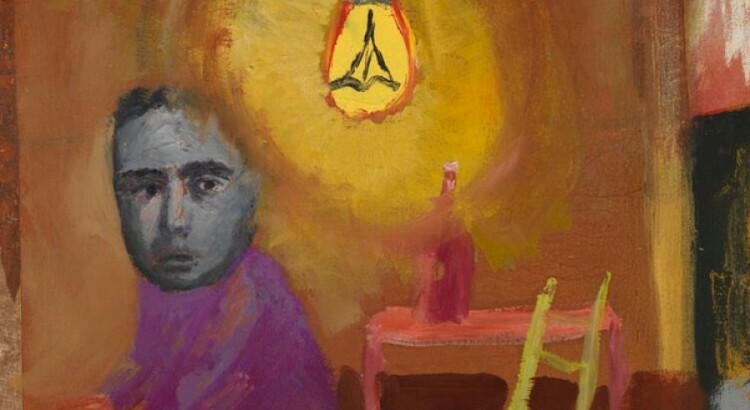 He saw in the referendum a way of escape from his political impasse. He thought that if he blackmailed Greek people (yes=bailout – no=default, yes=euro-no=drachma) he would have won the referendum. As a result, he would have bought some political time. Of course, bourgeois politicians who have elementary political sense, they are too afraid of this referendum. They see it is highly possible that NO will prevail, something that might open the doors of hell for European capitalist economy. For the Movement the challenge now is to continue massive mobilization in order to take back everything has been stolen from us since 1,5 year. 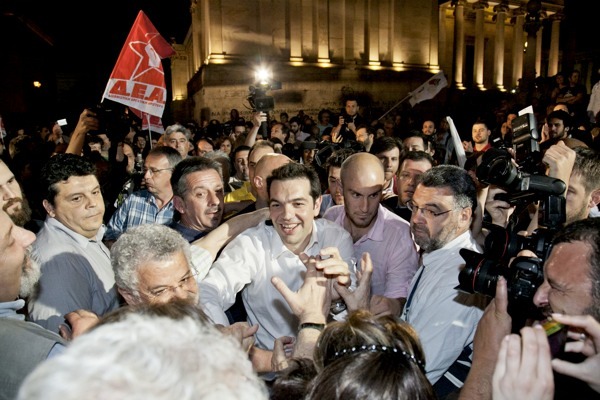 A Papandreou fall would be an important symbolic victory, but it wouldn’t change anything in everyday life. A real change is what we are asking for. 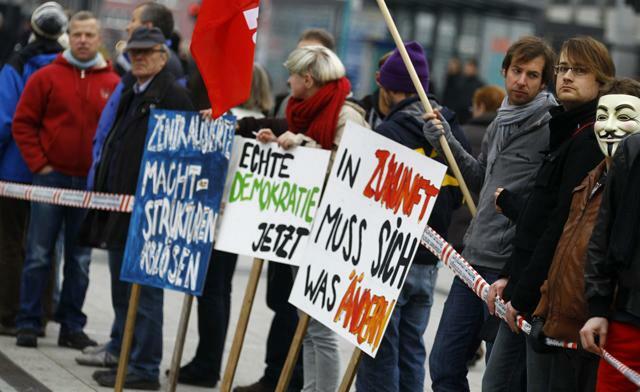 And a potential government of “national unity” (Right, Extreme Right and Socialists) might be a really tough opponent.